The momentous occasion of the 1976 American bicentennial may have overshadowed any other events or milestones of that year, but filmmaker Randall Miller is attempting to rectify that with the film, ‘Bottle Shock,’ which highlights a lesser-known true event of California vintners shocking the wine world and putting Napa winemakers indelible stamp on the map. A blind tasting contest held that year in France and judge by a who’s who of native wine experts, pitted California wines against the best of France. Not only were the judges stumped by which wines were from which region, they, to their own surprise, ended up selecting the Napa entrants as resounding winners. In fact it was so assumed that the fine French would blow out their American counterparts that only one journalist was interested and in attendance. That journalist, George Taber would chronicle the event in the book, Judgment of Paris: California Vs. France and the Historic 1976 Paris Tasting That Revolutionized Wine. Working his way to the stirring victory of the film’s finale, Miller uses three main characters to drive the story. First is Steven Spurrier a transplanted snooty Brit played deliciously by Alan Rickman who owns a failing wine store in Paris. In an attempt to drum up more business while garnering respect in the close-knit French wine community, Spurrier devises the tasting event. His biased American friend enlightens him to the buzz about up and coming wines of Napa and urges him to seek out American wine samples as an additional hook for the event. Intrigued, the desperate entrepreneur sets off to round up worthy competitors from the New World. It is there that Spurrier meets the other two principal characters, Jim Barrett who is the stressed and broke owner of Chateau Montelena, and Barrett’s hippie-esq slacker son, Bo. Immediately, worlds collide- overall between snooty Spurrier who is skeptical of Napa’s wine quality and that hard-working community desperate for respect and a break in the world market, and more specifically between the elder and younger Barrett. Bill Pullman embraces this role of a passionate, yet distraught man clinging to his dream of the vine and painstakingly avoiding the need to return to his corporate roots. Likewise, Bo is portrayed impressively well by Chris Pine, who looks like a 23-year-old Brad Pitt and displays noteworthy potential. The fringe characters add color, and in some cases cliché, to the plot and sub plot: Gustavo, a Montalena worker-bee, who is the son of an immigrant field hand and especially adept at winemaking in his own right. And Sam, the “hot,” yet spunky and bright viticulture intern who sparks a desire in Bo in more ways than one. Set amidst the real drama of this rich historical event, the story is interesting and worth telling, but probably would have been better served in the hands of someone willing to linger over the details and the real back story. Some of the cast is impressive, while the rest are adequet to cliche, and the photography is delectable, panning over sometimes dry countrysides, rolling hills and juicy grapes. Overall, Bottle Shock is enjoyable, albeit somewhat predictable, but it feels like it could have been and should have been more. It’s hard to say if the film’s set up is too quick or too slow, but it definitely is lacking in character and story development and feels like a movie that keeps safe and to the surface. Instead of giving a fully drawn back-story of Spurrier and Barrett or one of the winemaker’s of Taber’s book, ‘Bottle Shock’ opts for the simpler route, which only works on one level. Because of its wine theme Miller’s film will unavoidably and undeservedly draw comparisons to the Alexander Payne’s 2005 hit, ‘Sideways.’ Other than the fact that both films have characters that are passionate about and drink wine, there are no parallels. 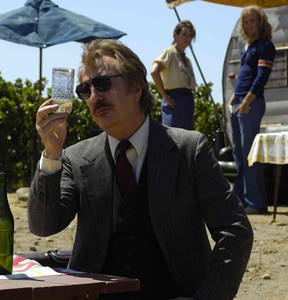 Wine and Central Coast wine country is the backdrop for fully developed relationships in Payne’s superb drama-comedy; Napa Valley wines as the triumphant underdog is the too understated story of ‘Bottle Shock’ and the relationships are the backdrop.